This past weekend I took a road trip to visit my hometown. I no longer travel long distances without an audiobook (or six... c'mon, you've got to have backups in case one is skippy or boring) to keep me company. Since I left at a rather ungodly hour (5am! ), I needed something with a lot of adventure to start with. Hurricane by Terry Trueman certainly fit the bill. This adventure story tells of a Honduran family dealing with Hurricane Mitch. Thirteen-year-old Jose has nothing bigger on his mind than school and playing soccer when tragedy strikes. With his father and older siblings missing, Jose has to take charge, helping neighbors dig family members out of the mud slides and finding a doctor for his sick baby brother. Hurricane is filled with suspense as the storm strikes and then as the village deals with the aftermath - flooding, mud slides, lack of food and lack of water. Narrator Ramon de Ocampo is particularly talented at giving each character a distinct voice. This is a great choice for middle grade kids and teens who like adventure stories about natural disasters. Next up was The Egypt Game by Zilpha Keatley Snyder. This was a favorite of mine when I was a kid and the audiobook was great. Eleven-year-old April Hall isn't planning on staying with her grandmother in this small college town for long. Soon, her actress/singer mother will finish her tour and come fetch her and they'll go back to LA and be fabulous together, just like before. In the meantime, April isn't planning on getting settled or making any friends. But when she happens to be walking past the back of the old second hand shop with a neighbor girl, they inadvertently discover Egypt. Oh, it isn't the real Egypt, but with the help of active imaginations and a cast-off bust of Nefertiti, the Egypt Game begins. When a crime in the neighborhood threatens the future of their beloved game, what will April and her friends do? This classic story of imagination and friendship stands the test of time and I loved the story just as much as I did when I was ten. Narrator Alyssa Bresnahan is one of my favorites. I could listen to her voice all day! This is a great choice for family listening. 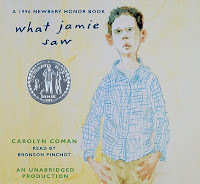 I didn't act ually think I would like What Jamie Saw by Carolyn Coman, but I popped it in and was immediately hooked and had to listen to the whole thing. What Jamie saw was his mom's boyfriend throwing his baby sister across the room. Luckily, Jamie's mom was quick enough to catch her and the three of them left that night. This gem of a book tells what happened after the incident and how Jamie and his mom begin to conquer their fears and put their lives back together. This is a great listen for middle grade and teen readers who like "issues" books. The only violent act is that first one at the very beginning of the book. Jamie and his mom are multi-dimensional characters, imperfect and trying to figure out their problems and get back on track. There's lots to discuss with this book and, though it's short, the characters and story will stick with you. Narrated by Bronson Pinchot. 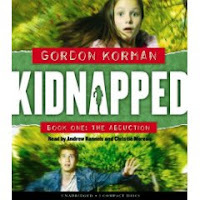 I only listened to a bit of Gordon Korman's The Abduction but stopped it because I wasn 't getting into it. I want to mention it because I think the narration was really neat. It starts off with an introduction read in a sort of news-reporter-y voice and then the chapters are told in alternating perspectives. Meg is narrated by Christie Moreau and Aiden is narrated by Andrew Rannels. Listeners might want to pick up the On the Run series by Korman as that's where Aiden and Meg first appear. And I got into the third disc (out of five) of Will Hobb's Downriver. I'm quite enjoying it so far. Forced into a "wilderness therapy" program called Hoods in the Woods, Jessie is unable to stop thinking about her dad and his new wife. Then someone comes up with the idea to "borrow" the leader's equipment and set off on a white water rafting trip through the Grand Canyon. The story has tons of adventure and likeable, multi-dimensional characters. Will Hobbs is definitely an author I'll recommend to kids looking for adventure stories. I'm always looking for new audiobooks, as I listen to one in the car and one when I walk at night. I've read What Jamie Saw, but other than that, haven't read any of the others, so I'll definitely be giving them a look! Thanks! I'm so glad that you mentioned "The Egypt Game"--Zilpha Keatley Snyder was one of my favorite authors growing up, and I especially liked "The Changeling." I don't listen to books that often, but I'll probably go reread some favorites that you reminded me of. Thanks!